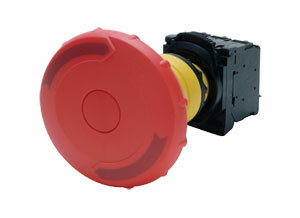 Omega's rugged OMPBD7 E-Stops offer maximum flexibility and a wide choice for all applications. This 22 mm line is aesthetically appealing and modularly designed to make assembly and interchangeability easy. What is Momentary vs Maintained? When a pushbutton is pressed, it will open or close a circuit. A momentary pushbutton will allow the electrical contact to return to is original position when the pushbutton is released. A maintained pushbutton will keep the contacts in the changed position, it requires some additional action to return to is original position. What is a Tool-Less Mounting Latch? Quick, reliable and strong, it's the best pilot device mounting latch available in the industry. Once the E-Stop operator is installed in the panel, the Tool-Less latch pushes onto the back of the operator with a "click". Now you can snap on up to 6 contact blocks, with no tools. What are the Environmental Ratings? Front elements, including push buttons, mushroom operators, selector switches and E-stops, are IP 66 protection against submersion, oil and dirt, making them reliable in the toughest industrial environments. OMPBD7P is a plastic operator with a captive black plastic front bezel. Constructed of high-grade thermoplastics the OMPBD7P is the corrosion resistant solution for harsh environments and is rated NEMA Type 4/4X/13 &AMP; IP65/66 for use in wash down locations. For super tough applications, the OMPBD7M has a die-cast zinc housing and mounting ring for rugged durability. Both are finished with corrosion resistant chrome plating. The OMPBD7M also features a captive shiny metal bezel for a polished appearance. Metal operators are NEMA Type 4/13 &AMP; IP65/66 rated. Twist-to-Release - add up to 4 additional contact blocks. Light modules sold separately below. Push-Pull - add up to 4 additional contact blocks. Light modules sold separately below.